HERTALAN® supplies EPDM roofing systems which can provide every flat roof with the best covering. HERTALAN® EASY WELD is an unique roof system developed especially for mechanically fixed roofing methods. The seam is sealed with hot air. The rolls have a width of 1.40 metre and 20 metres of length. This means that with one seam in this system a flat roof of approx. 50-56 m² is covered. During the production process we apply a UV-resistant green weldable strip. These welding strips are heated up with hot air during the installation process so that a waterproof connection is created, for a seamless flat roofing. hertalan easy weld MF is specially designed for mechanically fixed roofing systems, where the fixing is made in a specially created overlap area. This makes steel roofs easily accessible to a homogeneous EPDM roofing systems. On the upper side of the underlying roll and on the underside of the overlapping roll a green EW welding strip is attached. During the installation these EW strips are connected with hot air to create a green-on-green waterproof seam. hertalan easy weld is a product with unique properties, has an exceptionally long life expectancy, is fire retardant, requires minimal maintenance and is both root- and UV/OZONE-resistant. The environmental impact is negligible and the return on investment significant. From reference lists of the participating elastomer EPDM producers SKZ selected 39 roofing projects in Germany, Austria, the Netherlands and Sweden, from late 90s ranging in age and installed between 1968 and 1996. From the samples taken, the mechanical properties were determined, such as hardness, tensile strength and elongation at break. 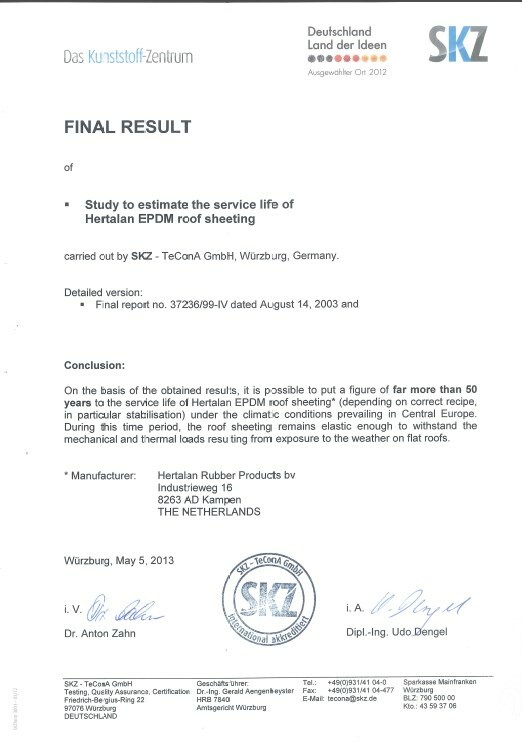 On all roofs that were investigated, the EPDM roofing materials fulfil its function as waterproof membranes completely, the samples were visually no serious ageing visible.The final outcome based on the service life for HERTALAN® EPDM roofing was >50 years. 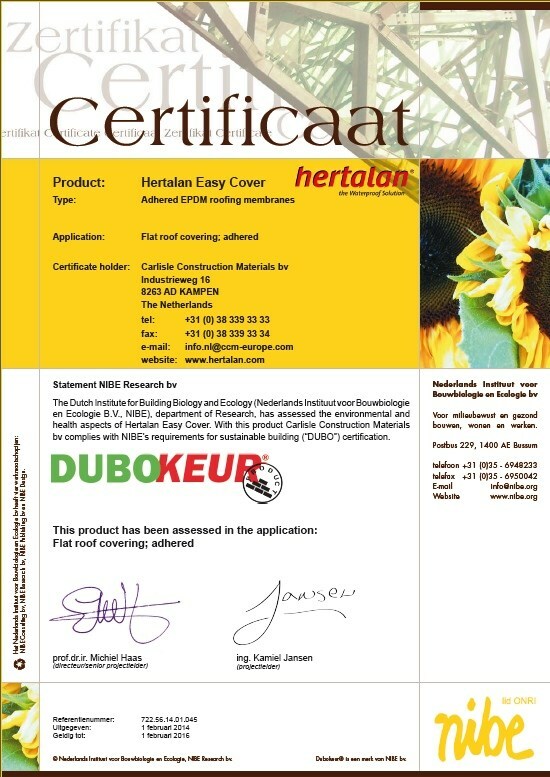 HERTALAN® products have been awarded The DUBOkeur® accreditation. The DUBOkeur® certificate proves that a product, material or property is an environmentally friendly choice. This is demonstrated by means of an environmental life cycle assessment made by the Dutch Institute for Building Biology and Ecology (NIBE), the research institute for environmental building materials. The purpose of the DUBOkeur® label is solely for the top end of the market in the field of sustainability, so it really worth getting! By commission of Carlisle Construction Materials bv the Institute of Horticulture, University of Applied Sciences Weihenstephan has tested our HERTALAN EPDM roofing products. In this intensive, 2 year during test, the resistance to root damage of the flexible sheets hertalan easy cover and hertalan easy weld was determined.